RTU Foreign Students Department (FSD) is proud of 16 bachelor program, 42 master program and 1 doctoral program foreign student who successfully defended thesis and were awarded with academic degrees this winter. Especially FSD wants to highlight Ruslan Batalov who graduated the Faculty of Computer Science and Information Technology with distinction and Kamran Ayub who obtained a doctoral degree at Automation and Computer Engineering. Do you like the topic of research? Is there a concrete timeline? How is your supervisor as a person? What do his or her employees say? Is he or she active on publishing? Do you have the feeling that you can work together? Kamran Ayub also advices students to use social media while doing research. He says: “You should connect with people, exchange ideas, collaborate.” He also admits that it is always a good idea to become a member of PhD or postdoc association in your institute. The last but not the least he says is to make sure that you have a long term plan for yourself, have in mind what you want to do next. In the meanwhile, make sure you have all tools you need for your next step. There are more than 45 full degree programmes offered in English language to international applicants across various study fields enabling prospective applicants to select the more suitable one for their professional development. 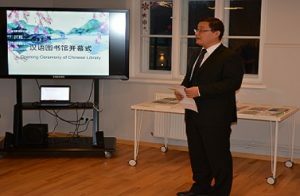 This year on December 20 first Chinese books were delivered and displayed at Chinese corner in Riga Technical University (RTU), 3 Kronvalda Blvd. A special ceremony was held in presence of the Deputy Rector of RTU Igors Tipans and representatives of Embassy of China in Latvia Mr. Guo Haibo and Mr. Zeng Fuhua. 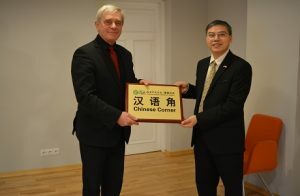 In cooperation with Confucius Institute Headquarters (Hanban), which provides Chinese language and cultural teaching resources and Embassy of China in Latvia, Chinese corner was opened on May 7, 2016 to promote Chinese teaching at RTU. Books are available in room 203, 1 Kronvalda Blvd. This year on December 9 Riga Technical University Vice-Rector Igors Tipans and the Head of RTU Foundation Course Unit Natalja Muracova along with other representatives of universities in Latvia participated in the discussion with the Minister of Science and Education Karlis Sadurskis and the Minister of Economics Arvils Aseradens on the survey of CERTUS Policy Think Tank about the education export as one of the main driving forces of economics nowadays. The survey shows that the higher education export is considered as one of the fastest growing and key national economic forces. Last study year there were approximately 5500 foreign students in Latvia. It is estimated that each foreign student during the year spends an average of around 12000 EUR. All in all, during the last academic year higher education export generated the total added value of EUR 148 million, thus the export of higher education should be considered as an important sector of the Latvian economy. During the discussion the results of survey the main conclusions, such as Pardaugava Riga Campus development for students, the increase of role of the Ministry of Economics in the further development of higher education export and international students’ recruitment activities. Riga Technical University Foreign Students Department will continue working in cooperation with both Ministries in order not only to increase effectively the number of international students, but also to develop the economy of Latvia. On 08.10.2016 in the presence of the honoured guest Chief Minister of Western Province Mr. Isura Devapriya, Deputy Rector of Riga Technical University Prof Igors Tipans, Deputy Director of Riga Technical University Ms Zane Purlaura a reopening of Official Information and Study Centre of Riga Technical University at the Grand Royal Education office in World Trade Centre took place. The valued guests delivered their speeches to the audience, hoping for the future mutual successful work and cooperation. After the finishing of the official ceremony, Prof Igors Tipans and Ms Zane Purlaura (RTU) held the presentations about the University and study opportunities for Sri Lankan students and their parents in Colombo City Hotel. That was a successful campaign, aimed at delivering the information directly from the University to students in real life and face-to-face communication and interaction. Being the authorized representative of RTU, Grand Royal Education is positioned as an official representative of the University. The new office is welcoming visitors at Level 06, East Low Block, World Trade Centre, Colombo. The representatives of Riga Technical University will be attending European Higher Education Fair in New Delhi, India on 30 September and 1 October 2016. We would be happy to meet you and provide more information about RTU whether you are interested in establishing a new cooperation or applying for studies. Master in Civil Construction and Real Estate Management has been made more accessible to students from India.